Applying henna is an art form, I'm sure you can all recount good and bad experiences. One of my good experiences was when a family friend came over and she pulled a henna cone out of her bag and offered to do us a design. I wasn't expecting anything great, and ended up being blown away by her designs! 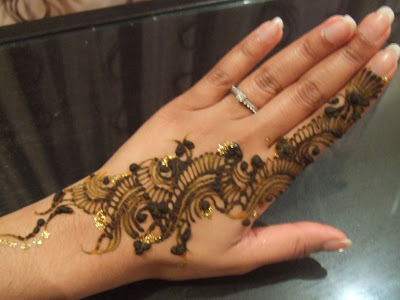 I thought to myself, I wanna learn how to do that...and so I went off in search of a henna course. After looking through the magazines, and searching online, it looked to me like every single established henna artist was running courses! Who was I supposed to choose? How much could I afford to pay? After much deliberation (and one eager henna artist sending me loads of emails and even adding me on msn!) I decided if I was going to do this, I was going to the VERY best: Ash Kumar "the world's leading henna artist". At £300, this course was one of the more expensive that I came across, but was it worth it?? Read on to find out!! After doing my research online, I rang up to get more info. The course was spread over two days, day one was intended to be more of a learning session, and day two, held a few weeks later was to allow you to get feedback on your designs and make improvements. The Ash Kumar staff were very efficient in letting me know dates and availability, and as soon as I'd got my funds together I went ahead and enrolled. I ended up being late (stupid train delays!) and as I reached the building, I'll be honest it looked like a shed!! (it was actually a converted garage!) But once I got inside I was pleasantly surprised to see it was really nice inside - I'm talking wood floors, warm tones, incense burning and a big mirror along one wall made the room seem spacious. All the other students had arrived before me and were sat around the large table in big comfy conference-room-style chairs. We got given the necessary health and safety information, and a short introduction from the very polished-looking AK staff, and then were told Ash would be with us shortly. Ash entered the room, and there was a friendly vibe about him. To break the ice we all introduced ourselves to the class and said a little bit about why we were on the course - there was a wide range of people there, an art student, someone from South Africa who ran a wedding business, someone who was planning to emmigrate to Australia. There were 7 students in total, and we had the pleasure of being joined by two recent students from Ash's "Total Look" program who were filling in some gaps in their knowledge. We then had a lunch break and I was a bit disappointed that lunch wasn't provided on this course as part of the price, I wasn't looking for anything fancy, even sandwiches would have been ok! There were lots of food places nearby though, so we didn't exactly go hungry. Well, I've told you the basics, but what was it actually like on the course? Is Ash Kumar a good teacher? Did I learn anything new? I'm afraid you'll have to wait for part 2! but don't worry, I promise I'll write it up soon! I need your advice - I'm considering becoming a professional makeup artist, and would like to enrol on the course to get a good background and grounding in this area. I am aware that many people go back to Pakistan, India etc to learn at the schools there, but this something I cannot realistically do. Please could you recommend the best way to go about this? a lot of these mke up artists claim to teach you but in reality many innocent young students get conned, read up on it get written confirmation on what is taught, nd by whom . you end up spending hundreds when half the artists dont even teach themselves. take ddierent looks ask about creating work you have seen by them. is it reall thier own, or just pictures they use. Do not do it with Riz Khan 'celebrity make up artist' very unprofessional, tacky and extremely disappointing! i have heard negetive comments about him - that he doesnt give 1-2-1 sessions but gets his assistants to do. He doesnt use terpines in the henna. So what does he use in his paste??? I want to take the course but i dont know if its worth it? hi Ive just read your comments about ash kumar and his courses as well as your experience.Ive been tring for along time to get to one of the courses but he doesnt seem to be doing any courses any where else apart from london. im looking to do the total look ash kumar course its the 8 day one. just wanted to knnow if its worth doing and do i actually learn in 8 days or is it just a waste of money.